Some of the BID staff decided to bring along their dogs for the interview last week. The Downtown Albany Business Improvement District is backing the park. Executive director Georgette Steffens said the planned addition of the venue is part of an ongoing effort to make downtown a welcoming, livable place and to help encourage the continued development of new residential in the neighborhood. 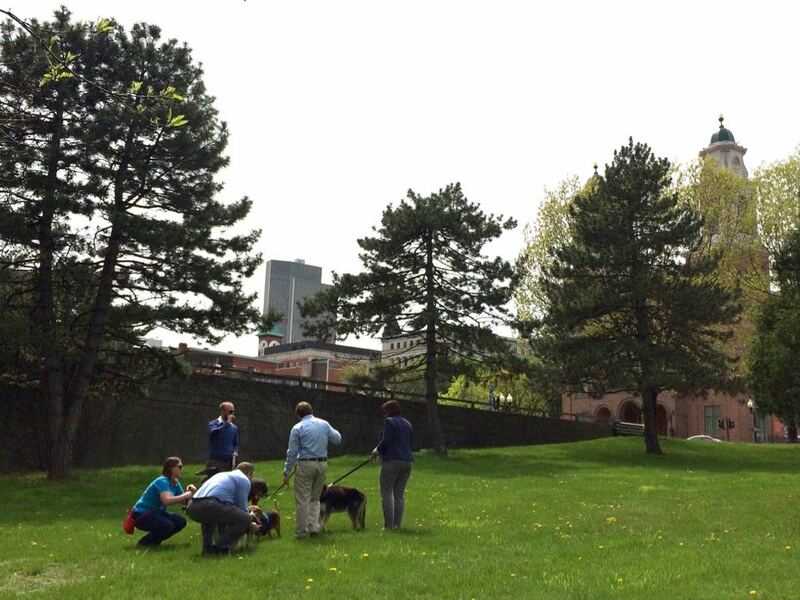 "We need to be making sure that we're providing things that attract people who want to live in the housing here," Steffens said while we stood talking in Wallenberg Park, the site of the future dog park. The hope is that the park won't just be an amenity that initially draws people, Steffens said, but it will also be a way for residents downtown to meet each other and form neighborhood connections. By the way: More than half of the residential buildings in downtown Albany allow dogs, according to Steffens. The approximate location of the planned dog park. 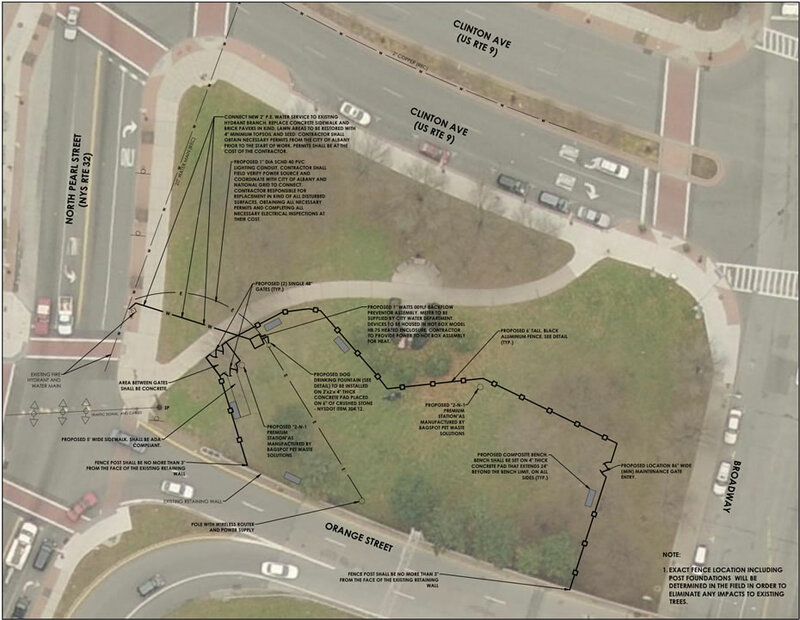 The 15,000-square-foot dog park will occupy a section of Wallenberg Park, the rectangle of of grass and trees bordered by N. Pearl, Clinton Ave, Broadway, and the I-787 on ramp. The land itself is owned by the state. 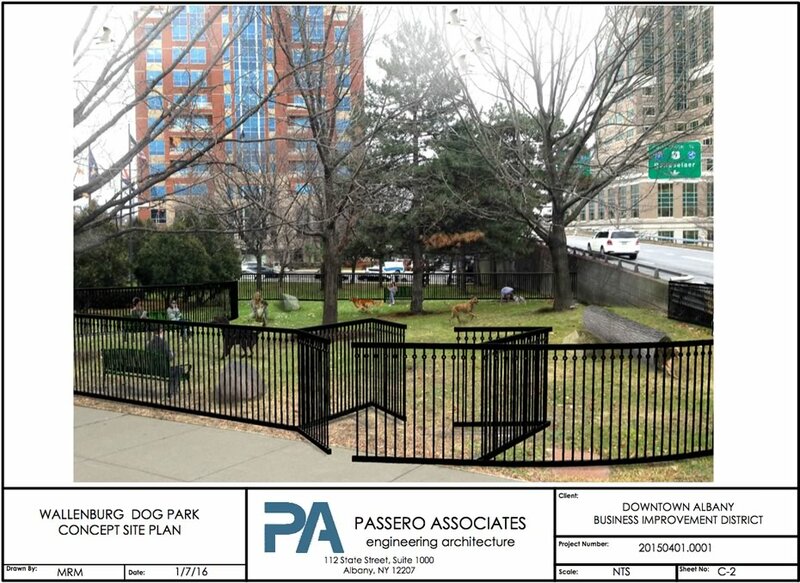 Much of the cost associated with the dog park is the 6-foot decorative metal fence that will surround it, with a double gate at the entrance. "We didn't want to do chain link fencing, we wanted to really match the high quality and historic nature of downtown," Steffens said. "That was really important to us, that it be aesthetically pleasing." Steffens said the city already maintains Wallenberg Park, performing tasks such as mowing grass, and will continue to do so after the dog park is added. The city will also help by emptying garbage cans and refilling the dog poop bag dispensers. Also in the works: Social events at the park, such as "Downward Dog Yoga" and a "Hops and Hounds Social." Steffens said the aim to have the dog park open by the beginning of July. If you're curious, there are plans, a rendering, and site photos at the top in large format -- click or scroll all the way up. The parade ground in Washington Park also serves as an informal dog park -- it doesn't have fencing. Oh, and a quick update on this year's downtown Albany public art project, which will involve artists customizing statues of Nipper. Steffens said the BID got more than 80 submissions to take on the challenge, so it's expanding the project from 10 to 20 of the three-foot-tall Nippers. Wi-Fi coverage? Please -- get off your social media and keep an eye on your dog. Bad dog behavior in dog parks (fights) happens when dog owners think dog parks are a place they can let Rover run and not pay attention. I just wish part of it could be sectioned for small dogs. The only two which offer these sections are Kinderhook and Colonie but you have to be a resident. With so many dog parks why can't one of them be small dogs only? What's the difference of a city run dog park and a standard city run park? The presence of a fence? What a great idea! This looks like a very attractive area . I can hardly wait to let all my dog lover friends know. 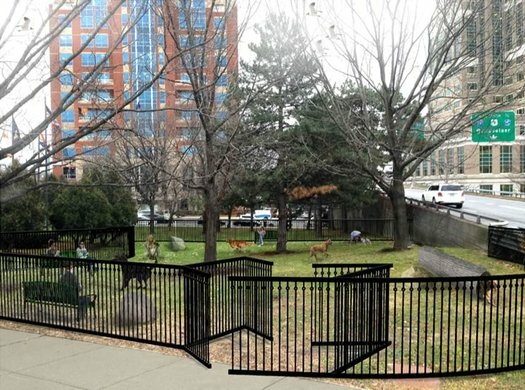 @chrisck, as a dog owner, I totally agree, but for those who will be enjoying the non-dog park piece of the park, Wi-Fi coverage is a nice benefit (especially for those of us who like to pop into the many downtown pocket parks for a quick bite to eat on lunch. Yay! Stop bringing your off leash dogs to Washington Park! Bring them to this place! Y'all forgot about St. Joseph's Dog Park adjacent to St. Joseph's church in Ten Broeck. Very close to this new park. Maybe it isn't run by the city? Is there a list or link to the downtown residences that do allow dogs? This statement is interesting, and if I was looking to move downtown it would be helpful to reference what options allow dogs "More than half of the residential buildings in downtown Albany allow dogs, according to Steffens"
Never trust an architecture/engineering firm that struggles with a simple understanding of symmetry as shown in their title block, which appears on EVERY. SINGLE. DRAWING. that comes out of their office. Don't forget about a place to wash Fido, a board to post on, and shovels for the dog runs! Also benches and picnic tables for us to hang and drink coffee! I live in another part of the city and my dog doesn't love the car, so I'm planning to continue my use of our current dog park, but love this idea! Dog parks are not only great for the dogs, but great for the people. They should have a section for the little dogs, as that is one of the more major problems at the current parks. Great. Now maybe the City could start enforcing leash laws in other park where dogs run amok (Washington Park, Normanskill Farm, etc.). All dogs are to be restrained by an adequate collar and leash, except that within the parks in the City of Albany, not including Hoffman Park, all dogs shall be so restrained or under the control of its owner or responsible person over 12 years of age. For the purposes of this section, "control" shall mean within sight of the owner and subject to immediate restraint. Fences certainly make it easier though, and especially at this location with so much street level traffic on three sides. That parcel doesn't get used for much other than a shortcut from Pearl St. to the Old English, so this sounds great. @Mike and @Greg: came here to point out the dog park at St. Joe's. It is city owned, fenced in, and has doggie bags. The park could use some TLC so I am a little confused why they are putting so much money into a dog park one block away from another dog park. Maybe there are limitations at St. Joes? Either way it would be nice to have the city put some extra effort into maintaining that park too. Love this, and would be great to see more of them. It would also be great to see poop bag dispensers placed throughout downtown, which would cut down on dog poop left behind inadvertently when dog walkers forget or lose bags. -B: Very interesting that the ordinance you cited covers people over 12 years of age, yet too many people let their young children in dog parks. Yes, you must control your dog and restrain the dog anywhere appropriate, yet the dog parks are specifically for dogs. I've seen too many instances of a jumpy dog scaring or injuring a kid, and I've seen kids unnecessarily annoy the dogs. For example, my own dog doesn't really like kids and one reason for it is because a child who came into the dog park would poke him. (The parents were useless.) There should really be an ordinance banning children under 12 if they are not covered under the control law. I love St. Joe's. Unfortunately there are significant holes in the fencing. Hopefully the new park's fence will be solid and tall, as it's surrounded by very busy roads. FYI, looks like the new park is complete (or dang close to it). An adorable doggy mural has been paitned on the 787 onramp abutment too. Great addition to the neighborhood! Park looks done but gate is locked. Any word on when it opens?